Carchet Chartreux is the passion of Carole McFadden and Chet Walborn, both active members of the cat fancy. 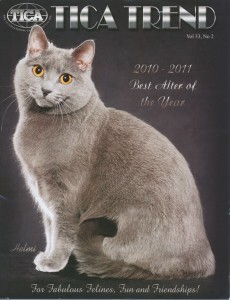 Carole is currently the elected Chair of TICA’s Chartreux Breed Committee. We started in the cat fancy by exhibiting our alters and premieres. We found we greatly enjoyed pursuing this activity with our cats and the wonderful friendships that have developed along the way. We have titled or cats to Grand Premiere and Supreme Grand Champion titles in CFA and TICA respectively while achieving Regional Wins, International Wins and Lifetime Achievement Awards. We have focused mostly on the Chartreux Breed for the past six years. We believe that being actively involved in exhibition is an important part in maintaining a high quality breeding program. We only breed on a very limited basis. When we breed, we breed for health, temperament and type according to the Chartreux Standard. We strive to preserve the early type of this very old historical breed as much as possible. Although we breed for show quality they are also wonderful pets. We are willing to help you find just the right companion weather it is a kitten or an adult. When we do not have something for you we will refer you to someone we feel we can trust . This is a hobby for us, a pursuit of excellence and not a business. We take our role as breeders very seriously. When we orchestrate new lives to come into this world we are responsible to make sure that they are as free from genetic defects or health concerns as humanly possible. That is why we assume the expense and effort to screen for known and/or possible health problems. Our breeding stock is screened by echocardiogram and evaluated by a board certified cardiologist to be free of physical manifestation of HCM. We evaluate our cats for absence of patellar luxation. We have had all of our cats tested to ensure they are free of FLV and FIV. We are striving to produce kittens which are Corona virus negative to prevent the development of FIP. Our cats test negative for Tritrichomonus Foetus. Our cats are raised with the best of veterinary care and fed a handcrafted species appropriate raw diet. We feed and recommend RAD raw organic diets to all our cats because they are obligate carnivores. Our cats are family members and our home is our cattery. Our cats do not live in cages. Our home is smoke free and we strive to keep it as safe and comfortable for our family members as possible. We are very selective about where our cats are placed as we feel it is our responsibility to see that they are happy, healthy and receive the best of care for their entire lives. A big ‘thank you’ goes to Nancy Dionne for entrusting us with our first Chartreux:-Lifetime Achievement Winner, International Winner: 5th Best International All Breed Alter, Supreme Grand Champion Alter and CFA Grand Premiere: Grandbois Augustus. 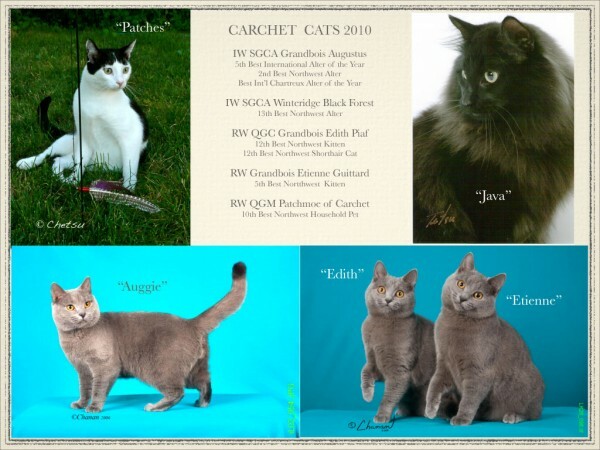 Thanks also for helping us establish the basis of our breeding program and for allowing us to co-breed wonderful Chartreux to show including TICA’s Best International All Breed Alter of 2011: IW, SGCA Etienne Guittard. We are forever grateful for your support. Additionally thanks go to Jeanne Johnson of Bluejean Chartreux for letting her beloved Abraham visit Carchet Cats for parenting duties when Edit’ did not want to travel. Banner design by Christine Church. Website created and hosted by Yes Exactly: Websites That Fit.